The governance of SPDC lies mainly with its Board of Directors (BoD) comprising of seven to twelve members serving on a voluntary basis. SPDC's Managing Director is an ex-officio member of the BoD. The Board provides strategic and policy direction to SPDC's management besides approving its annual work plan, budget, and audited financial statement. Mr. Javed Jabbar is a former Senator and Federal Minister for Information and Media Development, Petroleum and Natural Resources, Science and Technology. He takes an active interest in diverse fields including international affairs, voluntary work for rural and urban development, the environment, social issues and mass media. Globally recognized for his contributions in the field of environment and climate change, he was elected as the global vice president of IUCN. He is a founder member of the Citizens Media Commission of Pakistan, the South Asian Media Association, Baahn Beli and Strengthening Participatory Organization (SPO). Mr. Jabbar has several books to his credit. Ms. Shahnaz Wazir Ali, a noted educationist, has twice been a member of parliament, education minister and special assistant on social sectors to two Prime Ministers. She is also a Trustee of the 70 years old Education Trust Nasra School and serves on several prestigious Boards. She is the founding Executive Director of the Pakistan Centre for Philanthropy and is currently serving as President of Shaheed Zulfikar Ali Bhutto Institute of Science and Technology (SZABIST). Dr. Husain, currently Adviser to Prime Minister of Pakistan is a former Governor of the State Bank of Pakistan and Chairman, National Commission for Government Reforms and former Dean and Director of Institute of Business Administration (IBA). He also served the World Bank for two decades in senior executive positions. He is HEC Distinguished National Professor, Professor Emeritus and Chairman, Centre for Excellence in Islamic Finance at IBA and has authored more than 18 books and monographs. He is a recipient of the Nishan-e-Imtiaz. Prof. Dr Nilofer Sheikh, is currently serving as the Chairperson of the Centre for the Documentation and Conservation of the Endowment Fund Trust for Preservation of the Heritage of Sindh. 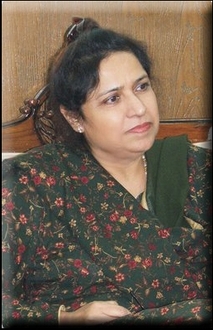 She is the former Vice Chancellor of Shah Abdul Latif University, Khairpur and Preston University, Karachi. She extensively collaborated with national and international institutions and was responsible for academic, administrative and financial management during her tenure. She has a Masters degree in Archaeology from the University of Cambridge, UK and a doctorate from Shah Abdul Latif University, Khairpur (SALU). Dr. Sheikh also has substantial academic experience in the field of Sociology and is a highly qualified researcher and lecturer. Ms. Fauzia Viqar is recognized widely for her work against gender and race-based discrimination. She has held senior management and advisory positions with government and non government organizations in Pakistan and Canada, where she has led legislation and policy reform; established the first ever gender-disaggregated database in Pakistan that is analyzed into annual Gender Parity Reports for Punjab; runs an effective women's helpline and; regularly builds the capacity of public officials for gender sensitive service delivery. She leads the Punjab Commission on the Status of Women as Chairperson since 2014. Chairman- Board of Directors at Si3 and its Founding Member, Mr. Rafi is one of the most eminent personalities in Pakistan's corporate landscape. He was elected Senior Partner of Ferguson in 1984 and administered tremendous growth as it became the largest and most prestigious tax and auditing firm in the country. He is a Chartered Accountant with over thirty-five years of expertise in auditing and taxation for the largest corporations in Pakistan and has counseled widely on mergers and acquisitions, floatation of companies, corporate governance and financial and tax planning. Mr. Rafi is a Fellow member of the Institute of Chartered Accountants in England and Wales, as well as Fellow of the Institute of Chartered Accountants of Pakistan. He has served as President of Institute of Chartered Accountants of Pakistan and also as President of Management Association of Pakistan. Ms. Panjwani is the Founder and Managing Trustee of the Panjwani Charitable Foundation and Trusts. She has established the Zainab Panjwani Memorial Hospital, the Dr. Panjwani School Complex for the Blind and the Dr. Panjwani Centre for Molecular Medicine and Drug Research at the University of Karachi. She has served as the Minister for Women Development and Population Planning in the 2007-2008 caretaker cabinet of Sindh and has served on the BOG of the Higher Education Commission of Pakistan for eight years. A Founding Director of the Pakistan Human Development Fund and numerous health and education bodies. She has received the Sitara-i-Imtiaz and Hilal-i-Imtiaz in recognition of her Public services. Dr. Pervez Tahir is a senior economist, distinguished professional, writer and speaker. Currently, he is the Chairman of the Bank of Punjab. He has served in Ministry of Finance and Economic Affairs Division. He rose to the position of Chief Economist, Planning Commission and retired as Managing Director of the ENERCON. He has been a member of the Statistical Advisory Panel of the global Human Development Report and Mahbub ul Haq Chair at GC University, Lahore.